The Telegraph has launched a new mobile app: Is it any good? The Telegraph has recently redesigned its mobile app. Now free, faster and with a greater focus on personalisation, it is part of the publisher’s aim to engage a younger audience. Another tiring maelstrom of tournament advertising is upon us. Sport transfixes in a way that pretty much no other (broadcastable) activity does, and therefore brands know that Euro 2016 offers value for money. TV, footballers and creative that travels/translates well is the advertising order of the day, with honourable mention for the role of Twitter and Facebook. The Daily Telegraph has come out on top in a report that examined the UX of newspaper paywalls. Also included in the survey were the Wall Street Journal, The Financial Times and The Boston Globe. The report follows Qubit’s website analysis framework, which looks at elements of the purchase journey, personalisation and mobile. This involves more than 80 criteria based on both the newspaper industry specifically and general best practice for websites. As mentioned, the Telegraph came out on top overall with 72%, followed by the WSJ (69%) and FT (66%). The Times achieved the lowest score with just 56%. Is The Telegraph’s metered paywall a good idea? Yesterday, the Telegraph announced the introduction of a ‘metered paywall’ which allows visitors to read up to 20 articles before having to subscribe for more. There are two options: a ‘web pack’ which allows access to the website and content via apps at £1.99 per month, and a ‘digital pack’ which adds tablet access and loyalty club membership at £9.99 per month. But can a paywall ever be a good idea for a general news site like The Telegraph though? And how will it affect the newspaper in terms of SEO and traffic to its ecommerce pages? The ICO’s one year amnesty on enforcement of the EU e-Privacy Directive ends tomorrow, and a few more sites have been rolling out their compliance solutions. BBC.co.uk launched its cookie info banner yesterday, while Channel 4, The Guardian and the Telegraph have today. 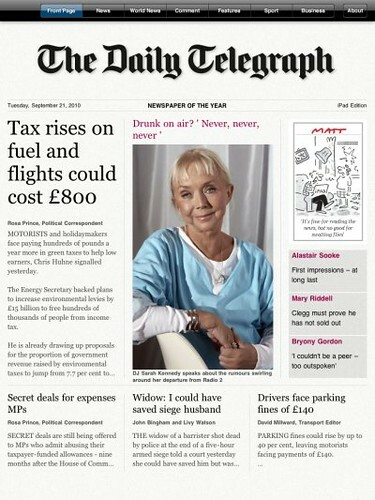 The Telegraph launched its first app for the iPad today, bringing the ‘editor’s selections’ to the device. The app will be available for download daily from 5am. It’s a free app, for a limited period anyway, which will be sponsored by Audi for the first 12 weeks. It’s an interesting move, and a good alternative to the paid apps from The Times and others. Julian Sambles is Head of Audience Development at the Telegraph, responsible for digital audience growth, engagement and page yield. He is speaking at our Online Marketing Masterclasses event next week to discuss how the newspaper uses search engines to acquire traffic, so I thought I’d ask him a few questions in advance about the Telegraph’s social media strategy. What does the Telegraph do better than the Guardian or the Times? Many of the big newspapers have launched sites specifically for mobile users, Graham Charlton has recently reviewed several of them here. But are duplicate sites really the way to go? How do you work out what to include? Above all, what happens if after all your efforts a mobile user decides to access your standard site and gets a poor user experience there? System Concepts has just tested the mobile and standard sites of three quality newspapers:The Times, The Telegraph and The Guardian when accessed using a mobile phone. Our results clearly highlighted some of the issues brand owners face in deciding their mobile strategy. The Telegraph’s social media strategy seems to be paying dividends, as its website now receives 8% of its daily traffic from news aggregators like Digg and Reddit, as well as Twitter. The newspaper’s Head of Audience Development Julian Sambles revealed this figure to Malcolm Coles on his blog, and based on the Telegraph’s 28m uniques in March, this equates to around 75,000 visitors per day from social media. It seems that The Telegraph has been using Digg successfully to drive more traffic to its website, and provides a useful example for other newspaper and blogs to follow. By encouraging readers to Digg the stories they are reading on the newspaper site, The Telegraph has managed to increase the amount of traffic it receives from the social news site, and is now largest recipient of Digg traffic in the UK. The Telegraph released an iPhone app last week, the first to be developed by any of the UK’s newspapers, though others will surely follow. In an area where few of the UK’s newspapers excel, The Telegraph had one of the better mobile versions of its site, so has it managed to create a decent iPhone app?